This article has been created in order to show you how this plugin can help a store owner can customize his or her orders to create multiple shipments. For the purpose of simplicity, we will be covering a real-life case, where a WooCommerce store owner needs to customize the FedEx shipments. If you are a WooCommerce store owner then you know that managing custom orders can be bothersome. It takes quite a lot of effort in order to do that. You would have to personally look into their requests to make the necessary changes in order to fulfill their needs. And if you deal with some third party shipping service like FedEx, then the order customization process becomes even more difficult to execute. In this case, you would have to coordinate with FedEx for the respective orders and make sure that the FedEx shipments are in line with the customer’s requests. The WooCommerce FedEx shipping plugin plays an important role in these type of situations. It simplifies many shipping related tasks and makes the overall process easier for both customers as well as the store owners. Keeping these things in mind, let’s have a look. We are using the FedEx Pak, and according to FedEx, only one FedEx Pak can be sent in a shipment. That is, if there are two FedEx Pak’s for the order, it should create two shipments. Can this be implemented with your WooCommerce FedEx plugin? He further asks to demonstrate the same situation for international shipments as well. You can check out more about this case by going through this link. By using our plugin, it is very easy to perform this task. Let us try to demonstrate the process by ordering two different orders. But first, you would have to choose the option to pack the items based on their weights and dimensions. This option can be activated in the FedEx settings under the WooCommerce Shipping setting page. If you go to that page, you can see the following option. Select the option- Recommended: Pack into boxes with weights and dimensions. Doing this will expand an option that displays the various packages including the FedEx Pak. It would look something like the following. Just enable the FedEx Pak and uncheck all the other options. After doing this you can scroll down and then save the changes that you have made. Now, let us order two different items as shown in the image below. The received order would look like the following. You have to open the order summary page and choose the received order. In the image above, you can see that the customer has ordered via FedEx 2 Day service. Now after opening that order, you can scroll down the page and see that the order automatically separated the items. You can refer to the following image. So, irrespective of the number of items placed by your customers the plugin shows the items in that order and the respective shipping charges for the same. Further, you can scroll down the page and see the following FedEx section. Note- It is important to make sure that the items satisfy the weight and dimension limits as given by FedEx. In this section, you can see two different Packages and both of them have the same shipping service as FedEx 2 Day. You have the option to choose the delivery methods manually. So, if your customer requests to send one of the items by some other FedEx service, you can do that here. After you have specified the service, you can further create the shipment by clicking on the Create Shipment button as pointed by the red arrow in the image above. Doing this will refresh the page and the shipment will be generated. Note- You can also create a separate package if you wish so. But, you would have to specify the weight and dimensions by yourself. Similar to the above procedure, you may choose a different FedEx service for this package. Further this step, you can generate the shipping labels for the packages. Here, you can generate two separate packages for the two different items. 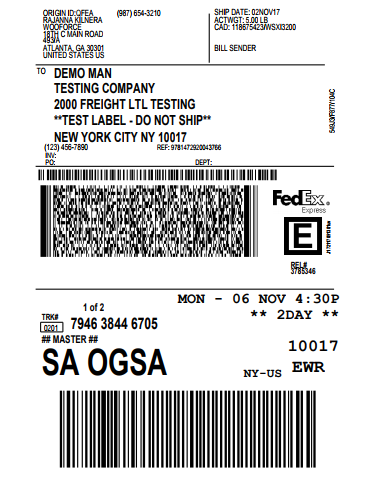 The option to generate the shipping labels would appear something like the following image. As you can see in the above image, you have the option to print the labels separately. And if you click on the Print Label options, the labels would be downloaded as shown in the following two images. As you can see that the labels are separated by the 1 of 2 and 2 of 2. Moreover, you can refer the shipping tracking IDs as well. Now, can you remember in the earlier section that you can add extra packages to your order? Well, you can print the shipping label for that package as well. Just go to the Creating FedEx shipments section. There, you can click on the Add Package and create a package as explained in the section. If you do this step successfully, you can print the shipping label for this new package as well. The WooCommerce FedEx shipping plugin is one of the best tools to manage your FedEx orders on your WooCommerce store. It has been designed in a way that is very easy to work with. Store owners can easily take their customer’s order and customize them according to their needs. 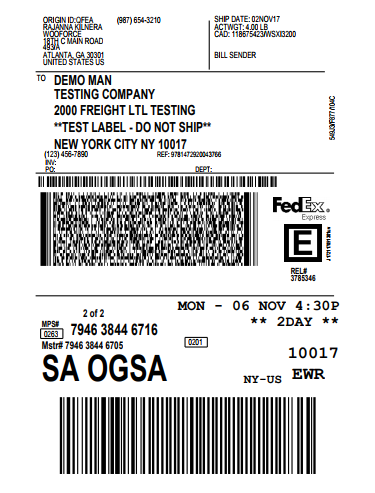 They can even print the FedEx shipping labels directly from the WooCommerce page. We hope we were able to provide you with enough information in this article. If you have any queries, you can comment down below as we would love to hear from you. You can also contact the support for further assistance.